Create your personalised desk calendar and brighten up your desk with a wire-bound calendar – just add your favourite photos. Our desk calendars are easy to make in minutes. Simply upload your photos and choose from a wide range of free backgrounds, special effects, lay-outs and clip-art graphics to give an even more personal touch. 210 x 100mm printed on 250gm gloss photo paper and wire bound in white and free standing. 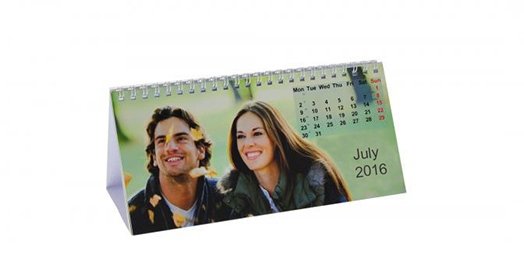 Desk Calendar Size: 210mm x 100mm. Our desktop calendars are beautiful and practical.